Q: What Should I Feed My Game Fish? 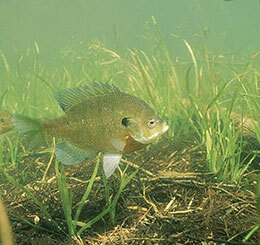 A: Sure, your bass, trout and other game fish nibble on nature’s all-natural bounty of algae, weeds, insects and worms. However, they also need supplemental nourishment, particularly if you’re growing them for sport. That’s where fish food, like The Pond Guy® Game Fish Grower Fish Food, comes into play. When choosing a food for your game fish, look for three vital ingredients on its label: protein, vitamin C and fish meal. The protein gives your fish amino acids that their bodies use to grow and repair muscles and other tissues, and reproduce and lay eggs. The protein quality and digestibility matters, as any that’s unused is excreted as waste. Vitamin C delivers essential antioxidants that help to fend off sickness and disease commonly found in game fish. Vitamin C also helps fish form collagen, which helps build strong bones and skin. Because fish don’t manufacture vitamin C on their own, they need it in their diets. Adding supplemental nutrients like vitamins, minerals, protein and fat, highly digestible fish meal helps your lake inhabitants grow to whopper size. Don’t think we’ve forgotten about carbohydrates! While ingredients like grains do their part to bind the food’s ingredients together, they’re not essential in a fish’s diet. Most fish will get their daily dose of plant-based carbohydrates when they nosh on algae or other sub-surface vegetable matter. Seeing those fish swim to the surface for food is certainly entertaining – and that enjoyment (coupled with dreams of giant fish!) might tempt you to overfeed. However, you should feed your fish an amount that they’ll consume in about 5 minutes. Any more than that turns into waste, which means more nutrients for algae. If your pond or lake is stocked with small fish or growing fry, crush a few of the pellets into tiny bite-size pieces for them. Along with the game fish food and foodstuffs found in the pond itself, you can also offer your fish human treats like torn-up chunks of stale bread, chopped up fruits and tiny minnows. They’ll add much-welcome variety to their diets – and help you clean out your refrigerator! Learn more about Game Fish Grower Fish Food in the video below. Pond Talk: What special treats do you feed to your game fish?